It doesn't matter how great your food is or how great the location is, if your restaurant's staff are not friendly and competent, customers are not likely to come back. Many restaurant owners open their own restaurant because they like to cook or want to be their own boss. Few realize how important the HR component is to running a restaurant. Inspiring the best from your staff is as critical to a restaurant's success as great food and great atmosphere. Read on for some tips for bringing out the best in your restaurant staff. As the owner or manager of a restaurant, you are in charge. And whether you like it or not, you are giving your staff permission to act as you do. If you come into work in a bad mood and treat people poorly, guess how your staff is going to act? On the other hand, if you come into work with a smile and a good attitude, it’s likely your staff will model that behavior. Inject staff meetings with some fun when you can. Make your meetings more fun with icebreakers and some easy team building activities. They only take a few minutes to do but will set a good tone for the meeting. Encourage some healthy competition among your wait staff, to see who can get the highest check averages each week or month. If you use comment cards, offer some sort of reward for staff who get good feedback. It doesn’t always have to be money. You could give movie tickets or a gift certificate to other local businesses as rewards for the person with the most positive comments. The wait staff is the front line of your restaurant. They deal with unhappy customers, even if the problem is out of their control. If the kitchen takes a long time to get an order out and the customer is unhappy, guess whose tip is going to suffer? Not the sous chef or line cook. By keeping customers happy, you are also going to keep your staff happy. The next time a customer complains, authorize your wait staff to offer a freebie, like a dessert or a beer on the house. Restaurants have hierarchies, from the manager to the dishwasher. Every person on your staff is integral to the day-to-day operations and overall success. Be sure that you are respectful to each and every one of them and that they are respectful to each other. Ask your staff about their personal lives – kids, hobbies, interests. Show them that you see them as more than just a cook, a server, a dishwasher. 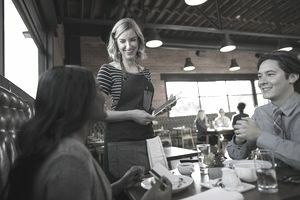 Check out these four ways you can be a better restaurant owner and get to know your staff better. Conflicts between staff are inevitable. Someone doesn’t think it’s fair they don’t get a good section on Friday night. Another person is always trying to get out of their Monday night shift. Whatever the issue, address it sooner than later, so it doesn’t breed more problems. Running a business is serious stuff. But that doesn’t mean you should have fun while you are doing it. Don’t be afraid to joke with staff and customers, to show your fun side. Ask for suggestions for ways to improve your restaurant. They can be about the menu, promotional ideas, colors for the restrooms if you’d like. Set up a process- it can be as simple as a suggestion box, with slips of paper- and review the suggestions once a week. You may find that your staff has great ideas to try. It is probably the easiest thing you can do. Be liberal with your thank you’s, to show staff that you truly appreciate the work they do.